Surrounded by some of England’s finest scenery and natural beauty the village of Ambleside is situated in the heart of the Lake District National Park. Its central location makes it an excellent starting point for exploring all areas of the Lake District. Lake Windermere, England's longest lake is an easy 20 minute walk from the cottage. 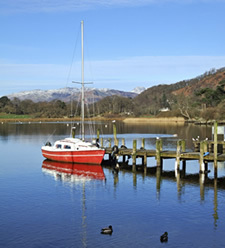 For a leisurely day boats can be hired and a variety of cruises on the lake are on offer or you can simply enjoy the dramatic views and imposing profile of the Langdale Pikes across the lake whilst enjoying a coffee or a pint in one of the pubs or cafes at Waterhead. As you will no doubt be aware the Lake District is renowned for its wonderful fell walking, made known to many through Alfred Wainwright's walking books. The fells of Fairfield, Loughrigg, Wansfell and Rydal are on the doorstep and Langdale, Troutbeck, Grasmere, Hawkshead and Coniston are within easy reach. Eating out in Ambleside is an absolute pleasure with all tastes and budgets being catered for. The town has more than its fair share of restaurants, cafes and tea shops catering to all tastes. Vegetarians are well looked after with Zeffirellis and Fellinis (both have cinemas attached so after your meal you can watch the latest blockbuster); there are two Thai restaurants, Doi Intanon and Jintana; the Jade Garden is a Chinese restaurant and the Lucky Dragon a Chinese takeaway. In addition, there are Dodd's, Sheila's Cottage, The Old Stamp House, The Lake Road Kitchen and Lucy's and many many more. You will be spoilt for choice. Ambleside also has a wealth of pubs and wine bars. Many offer excellent reasonably priced pub grub and live music. For fans of real ale the Unicorn and the Golden Rule are less than a 5 minute stroll (stagger) from the cottage. If you choose to eat in, Ambleside has several small supermarkets, bakeries, greengrocers, an award winning delicatessen and Garside’s butchers (known locally as Freddie’s) is just round the corner from the cottage. Try out his delicious Cumberland sausages, bacon and sausage rolls. The town also hosts a multitude of specialist shops which make a refreshing change from the usual High Street chain stores, with art galleries and many shops selling equipment for walkers and climbers. Many well-known characters have been connected with Ambleside, including William Wordsworth, John Ruskin and Beatrix Potter. There is plenty for all ages to see and do in the Lake District but to make the most of your stay I suggest you visit The Tourist Information Centre. You will find this at the Old Market Cross in the centre of Ambleside.